In late fall and early spring the small blue-green basal leaves of Streptanthus cordatus are quite noticeable growing on open, sandy areas. As spring days warm, the long, slender, elongating purple stalk attracts even more attention. The heart-shaped, blue-green, glaucous leaves broaden and clasp the long, slender, leaning stalk. Dark purple buds, appearing at first glance to be flowers, top the stalk, which continues to elongate. Lower buds open first to a yellow and purple twisted delight of a flower. 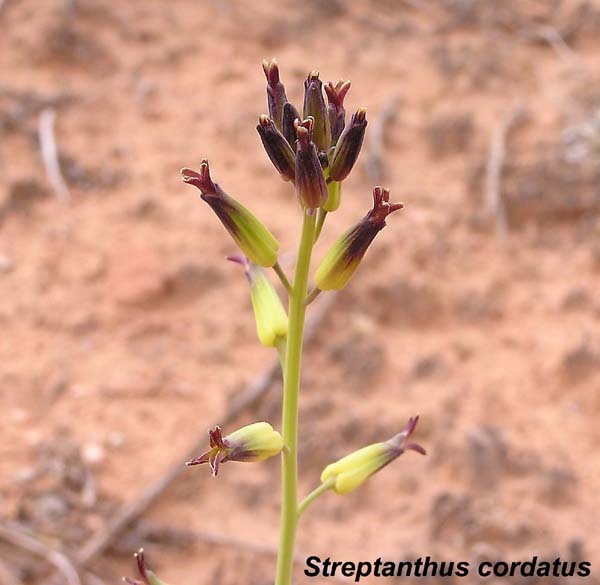 In moist springs (such as 2001 and 2005) the stalk might grow to three feet tall with several dozen flowers spread evenly. Eventually flowers are replaced by upward-curving three inch long and quarter inch wide seed pods.